Manuel Iris was named Poet Laureate of Cincinnati in April 2018. He is the winner of the “Merida” National Poetry Award for the book Notebook of dreams (2010), and of the Rodulfo Figueroa Regional Award of Poetry for the book The disguises of fire (2014). Iris is the co-author, along with the Brazilian poet Floriano Martins, of Overnight Medley (Brazil, 2014). His work has been included in national and international anthologies of poetry, including Postal del oleage, anthology of Mexican and Colombian poets born in the 80s, published in both countries. Recently, two personal anthologies of his poetry have been published in Venezuela and El Salvador. Iris holds a PhD in Romance Languages from the University of Cincinnati. RODNEY GOMEZ: Thank, you, Manuel, for talking with me. First of all, congratulations on your laureateship! That is quite an honor for any poet, especially one living in a vibrant city like Cincinnati. MANUEL IRIS: Thank you so much. As you can imagine, I am very thankful to the Queen City. I have said many times that all that I do during my laureate tenure will be returning, with love and poetry, that act of generosity. GOMEZ: Cincinnati is your current home. You were born and raised in Mexico and have lived in Cincinnati for a little over 10 years now. How did you come to call Cincinnati home? What is the story of your arrival and embrace of that city? IRIS: I came to Cincinnati in 2008 to begin my doctoral studies at the Romance Languages Department of the University of Cincinnati. There, I met many people that forever changed my life and view of poetry. Almost all of them were poets: Armando Romero, Maria Paz Moreno, Carlos Gutierrez, Floriano Martins, Pedro Lastra, Oscar Collazos, among my professors; and people like Arturo Gutierrez Plaza and Paola Cadena Pardo, among my peers. For several years I felt like a very fortunate foreigner. I was enchanted by the city and its history, by the snow and the people. I made many wonderful Cincinnatian friends. A little after 4 years I completed my PhD and, when I was making plans to go elsewhere, I met the woman that is now my wife. She is the reason I decided to stay in Cincinnati. Then, my daughter was born and now, because those two centers of my heart are from this city, I am a Cincinnatian, too. Poetry brought me here and love made me stay. And I believe poetry is a form of love. GOMEZ: You are quoted by the Cincinnati Public Library as saying that “Every poem is a love poem, we write because we love something.” As Poet Laureate you have been actively engaging the community to read and write more poetry. What is poetry’s allure for you? What can it accomplish? Why is it good for the average person to engage it? IRIS: I believe poetry is a human right. We need poetry like we need water and air. It is a necessity, just like music and any other form of art. We use poetry to open a door into our own heart and find what is in there. It offers us the possibility to enter someone else’s heart and to receive visits in our own. As you said, I do believe that any poem is a love poem, because we write about the things we love, about all the people and moments that we don’t want to be taken away by silence, by oblivion. Believing that art is not necessary is one of the major mistakes of human history. Art is the shortest distance between two strangers. For me, the most important allure of poetry is its ability to say with words what we can’t say with words. Poetry is a translation of silence. I believe it has the power of using words to express feelings or situations that are beyond language. To speak what is unspeakable is the work of poetry. It is not a minor act of magic. Every person needs, at some point, to communicate deeply with him/herself, with the others, and with Transcendence: that is what poetry does. Putting the invisible in the hands and hearts of any person, in any moment. GOMEZ: You teach at Depaul Cristo Rey High School. And yet you are also very busy as a poet—writing, publishing, and participating in various readings and literary events in the U.S. and abroad. How does your profession interact with your poetry? How do you manage both activities which take up so much of your time? IRIS: You forgot to mention that I am the father of a seven-month old! Haha. It is, indeed, very difficult to do so many things. I have a very rigid schedule and I am I learning to say no. Sometimes there is simply not enough time to do everything. I need to save time to read, write and to just to think and take walks. I need time to be in my house with my daughter, which is my main priority and, right now, my main source of poetic inspiration. I also have the continuous support of my colleagues and students at DePaul Cristo Rey. They all understand that my poetic career is part of my teaching persona. As a literature teacher, I teach about something I live and practice, about my personal passion and essence, and they value that. At school I am co-coordinator of a very active poetry club, and the co-coach of a two time city-champion spoken word team. I do not exaggerate when I tell you that poetry is part of the school culture. When talking about literature with my students, I come to clarify to myself my own literary ideas. For me, teaching and writing are the two sides of the very same existential coin. They feed off of each other. GOMEZ: You write in at least two languages: English and Spanish. You translate some of your work, but others have translated your work as well. 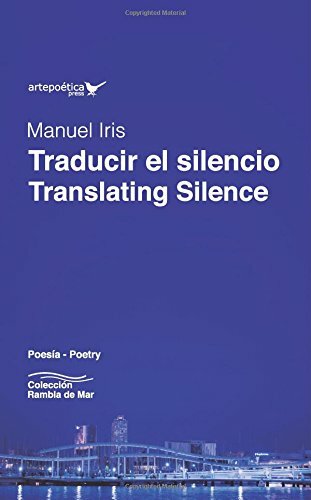 Your collection Traducir el silencio/Translating Silence is an exercise in that straddling of two languages. What do you see as the greatest difficulty of writing in English? And what do you see as the greatest difficulty of writing in Spanish? How does working in multiple languages affect your work? IRIS: Poetry is one of the very few activities that I still have to do in Spanish. Then, when the poem is written, I translate myself into English. This process has become more and more organic and fluid. Many times I prefer the way I expressed something in English version and I go back and change the original Spanish. Everyday, the process of translation becomes more a part of my writing and editing process. Also, I am now reading in English many authors that I’ve only read before in Spanish, and sometimes I like them better in English. It is a much more synthetic language and sometimes I want to be synthetic, though I love how exuberant, how sonorous, how musical and voluptuous Spanish can be. Working in more than one language makes you realize the sound, the melody, of your own ideas. I write singing: I walk around my house mumbling sounds that later become words, then later become syllables, then later become words, verses, poems. For me, appreciating languages is gaining a better knowledge of the raw materials with which you work: feelings, thoughts, and words. GOMEZ: Many of your poems are introspective and tackle big issues such as love. Yet you’ve also said that poetry is political in its nature. How do you reconcile these two concerns, the seemingly apolitical with the practical? Is there a contradiction there at all? IRIS: There is no contradiction: every poem is a political act, in the sense that every poem is a choice. The person that writes has chosen creation over destruction, life over death, love over hate. I believe that a love poem in the middle of a war is not the denial of war but the affirmation that love is possible under the worst circumstances. It does not matter what the poem is about: the act of writing in itself represents a life choice, and all life choices within a society have political consequences. Also: I am a Mexican poet that lives in Cincinnati and writes in Spanish. Am I not, just by writing in Spanish, by unapologetically being what I am, declaring my identity? Is this not a political stand? The day I was officially appointed as Cincinnati’s Poet Laureate I was given the opportunity to read, for the Cincinnati City Council, one of my poems. I chose one that I don’t believe is openly political. But I read it both in English and Spanish, so the Poet Laureate of Cincinnati was Mexican, and he was reading in Spanish. Was this not, especially in these political times, a declaration of human understanding and of the possibilities of poetry to create bridges between people that seem to be apart from each other? Was this not a declaration of the universality of human nature? Poetry is a practical and political endeavor. It is just not practical in the same sense that engineering is. If we understand usefulness in the common way, asking for the practical uses of poetry would be as inadequate as asking for the poetic uses of plumbing or masonry (even though virtually any human activity can be seen as an allegory of the poetic process). However, if we understand usefulness in a wider sense, poetry is useful to help us find ourselves within ourselves and within the hearts and minds of others. Doing that, helping us to realize that we are not as different from each other as we believe to be, could be the reason an engineer that knows how to build a rocket missile or a thermonuclear bomb decides to not do it, just like another man could have decided to hold a pen, instead of holding a gun. Poetry is useful to help humans become humans and that is a transcendental, unequivocal political act. GOMEZ: We’re living, unfortunately, in a time of great political upheaval in the United States. There are deep political divisions in this country so potent that they are even causing the destruction of friendships and familial relationships. How do you, as a poet of color and from a Mexican background, deal with this in your poetry? How does it find itself in your poetry? How do you speak to/about it? IRIS: The political upheaval you mention is part of my life in many private and public ways, and it is now more and more a part of my poetry. However, I wouldn’t say I write poems against any political ideology or character, though I reserve the right to write about anything whenever I feel the need to do it. I write only about the things I love. I have written poems about my language, about belonging, about my family in Mexico and my family in Cincinnati, poems about my daughter being a beautiful colored girl oblivious to the idea of racism, about my fear of the moment she will find out, and about my impossibility of sheltering her forever from that realization. All these subjects are, I repeat, political in their own way. Many times, when I read my poems, I am the only Hispanic person around, and I still read them in Spanish. I do not hesitate in showing others the beauty of my language and the possibilities of Hispanic poetry. Being what I am as a man, as a teacher, and as a poet, right now, is a political act. GOMEZ: What future activities do you have planned as laureate? It is a nomadic poetry reading series. We don’t have an official venue. Readings are held in a different space each month. Whenever it's possible, they will be held in non-traditional spaces. I am also planning a bilingual anthology of Cincinnati Poetry. My plan is to compile the work of many poets of the city and translate it into Spanish. This is a very ambitious project that I plan to complete by the end of my tenure. GOMEZ: What new projects of your own work are you planning? When can we expect to see them? GOMEZ: Thank you for taking the time to talk with me and good luck with the rest of your tenure as Poet Laureate. IRIS: Thank you, Rodney, and thank you you to the Latino Book Review. It was my pleasure.